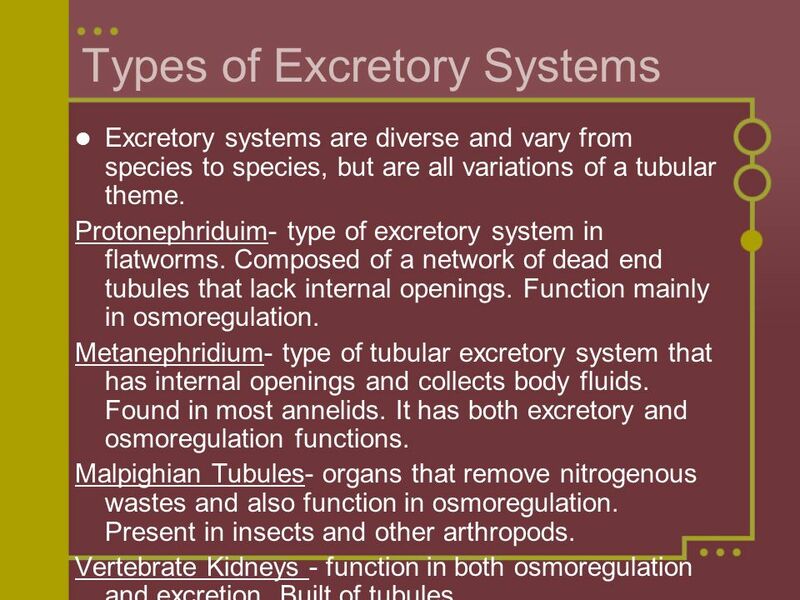 Excretory systems are diverse and vary from species to species, but are all variations of a tubular theme. Protonephriduim- type of excretory system in flatworms. Composed of a network of dead end tubules that lack internal openings. Function mainly in osmoregulation. Metanephridium- type of tubular excretory system that has internal openings and collects body fluids. Found in most annelids. It has both excretory and osmoregulation functions. Malpighian Tubules- organs that remove nitrogenous wastes and also function in osmoregulation. Present in insects and other arthropods. Vertebrate Kidneys - function in both osmoregulation and excretion. Built of tubules. 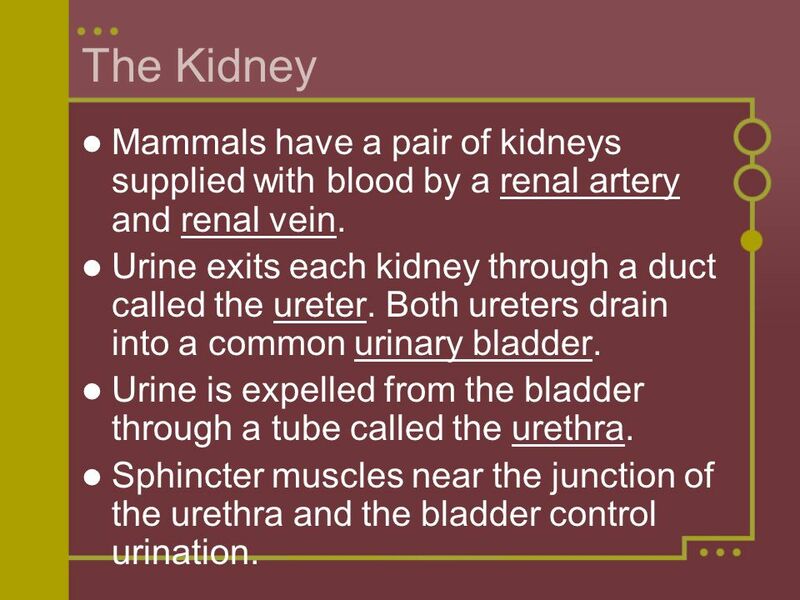 4 The Kidney Mammals have a pair of kidneys supplied with blood by a renal artery and renal vein. Urine exits each kidney through a duct called the ureter. Both ureters drain into a common urinary bladder. Urine is expelled from the bladder through a tube called the urethra. Sphincter muscles near the junction of the urethra and the bladder control urination. 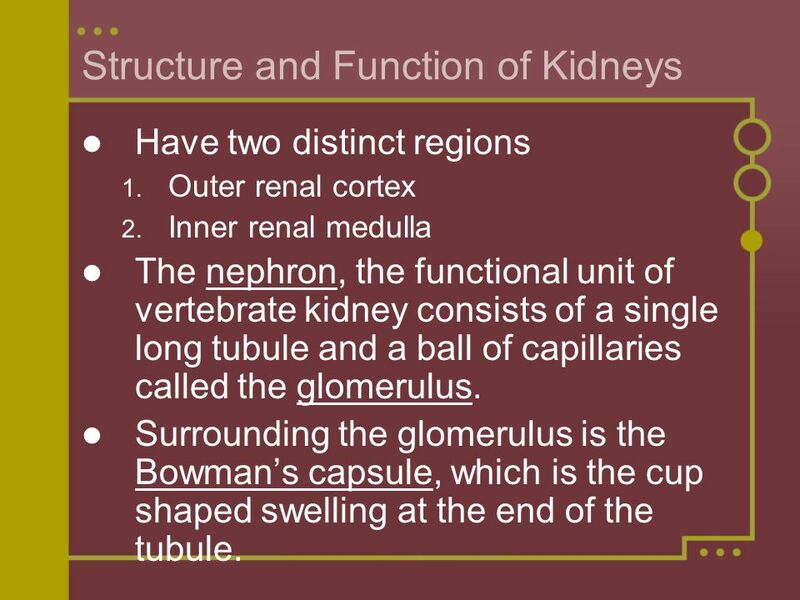 Have two distinct regions Outer renal cortex Inner renal medulla The nephron, the functional unit of vertebrate kidney consists of a single long tubule and a ball of capillaries called the glomerulus. Surrounding the glomerulus is the Bowman’s capsule, which is the cup shaped swelling at the end of the tubule. 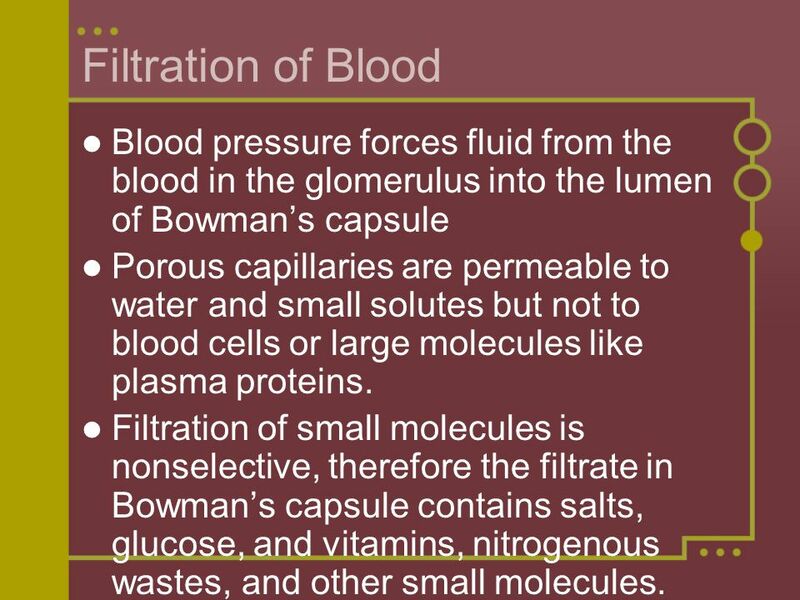 6 Filtration of Blood Blood pressure forces fluid from the blood in the glomerulus into the lumen of Bowman’s capsule Porous capillaries are permeable to water and small solutes but not to blood cells or large molecules like plasma proteins. Filtration of small molecules is nonselective, therefore the filtrate in Bowman’s capsule contains salts, glucose, and vitamins, nitrogenous wastes, and other small molecules. 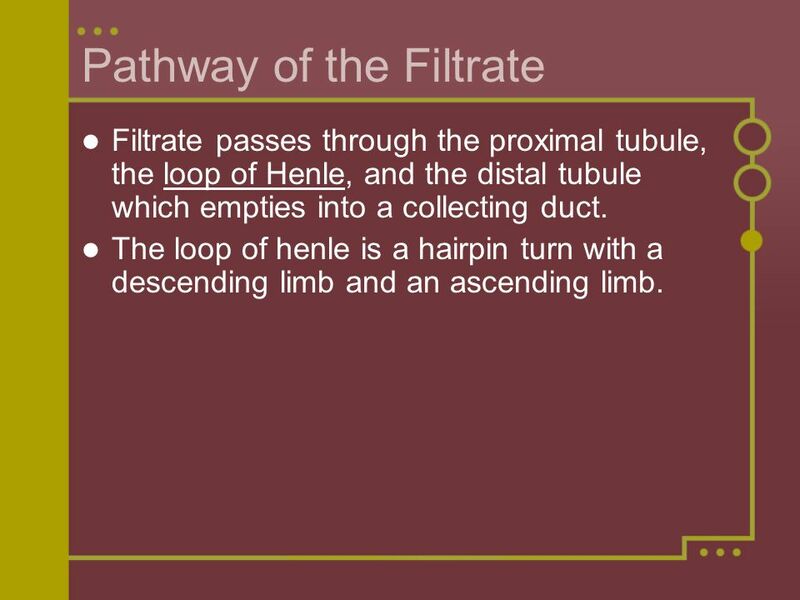 Filtrate passes through the proximal tubule, the loop of Henle, and the distal tubule which empties into a collecting duct. The loop of henle is a hairpin turn with a descending limb and an ascending limb. 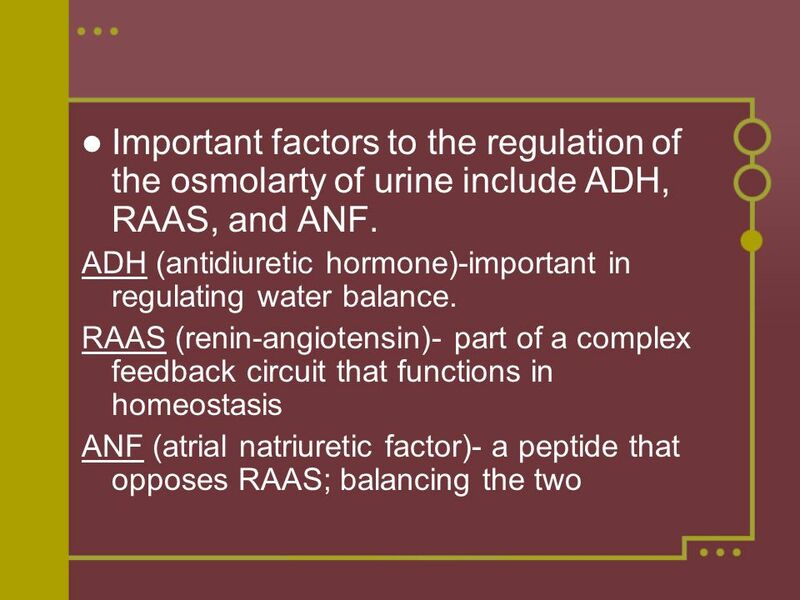 8 Important factors to the regulation of the osmolarty of urine include ADH, RAAS, and ANF. 9 An Overview The mammalian kidneys ability to conserve water is a key terrestrial adaptation. The collecting duct carries the filtrate through the kidneys osmolarity gradient, then more water exits by osmosis. 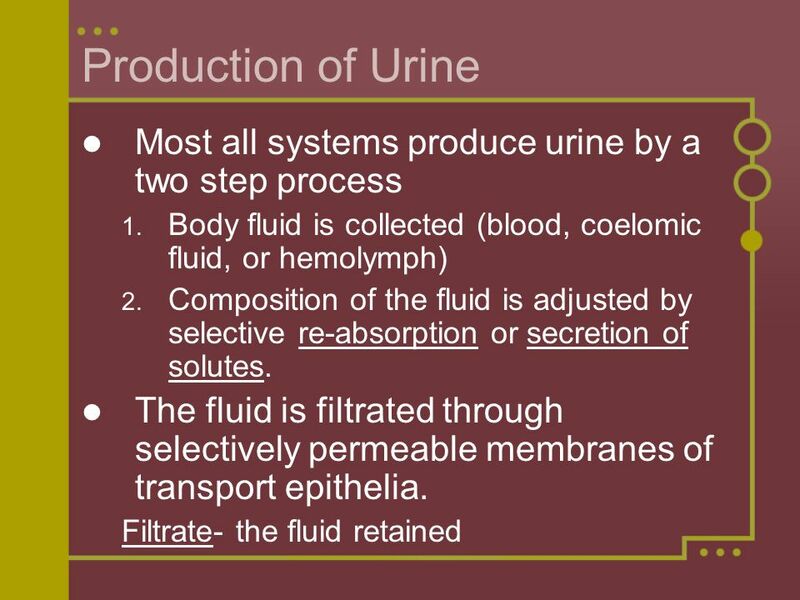 Urea containing salt diffuses out of the tubule and forms the osmotic gradient that enables the kidney to produce urine that is hyperosmotic to the blood. 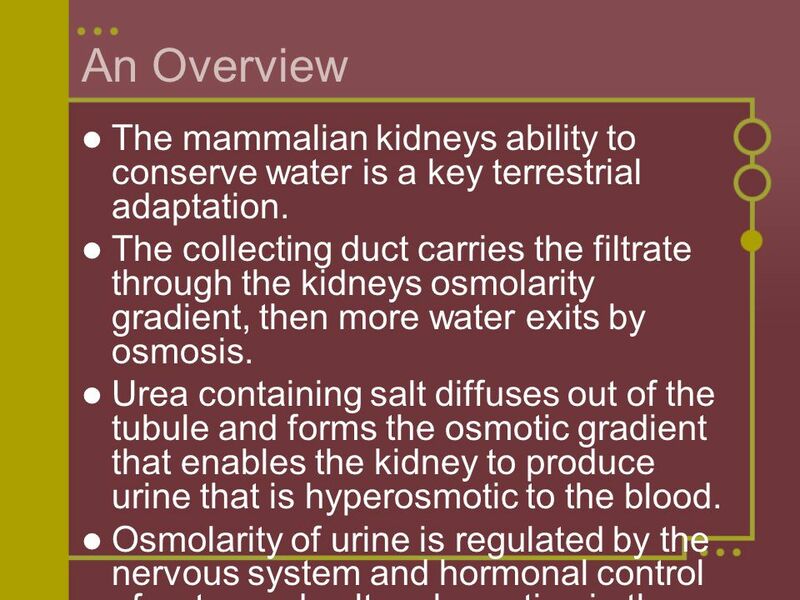 Osmolarity of urine is regulated by the nervous system and hormonal control of water and salt reabsorption in the kidneys. 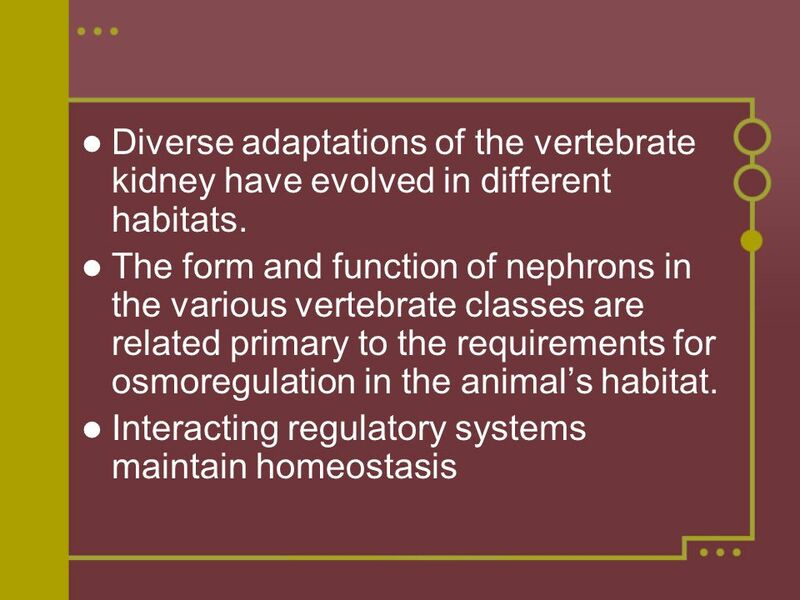 10 Diverse adaptations of the vertebrate kidney have evolved in different habitats. 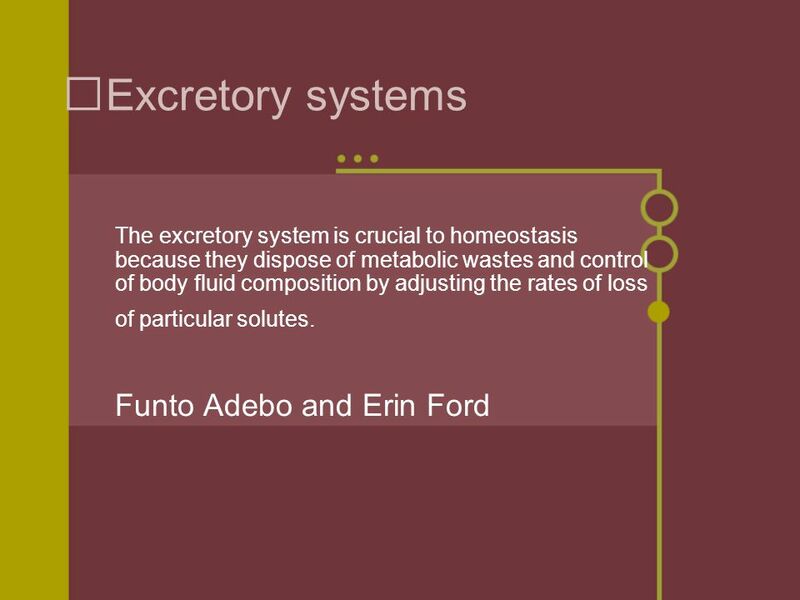 Download ppt "Excretory systems Funto Adebo and Erin Ford"
THE EXCRETORY SYSTEM Premedical Biology. David Sadava H. Craig Heller Gordon H. Orians William K. Purves David M. Hillis Biologia.blu C – Il corpo umano Excretory System and Salt and Water Balance. The Urinary System Glen Hookey Eric Kolker Justin Loeb Michael Ross Uston—Period 5. Osmoregulation and Excretion Chapter 44. Hormonal Circuits. Regulating The Internal Environment Ch. 44. The Excretory System Osmoregulation: management of the body’s water content & solute composition Controlled. EXCRETORY SYSTEM  Water balance on land or in salt water or fresh water are very different, but their solutions all depend on the regulations of solute. CHAPTER 44 REGULATING THE INTERNAL ENVIRONMENT Copyright © 2002 Pearson Education, Inc., publishing as Benjamin Cummings Section D1: Excretory Systems.  Most metabolic reactions take place in water  Maintenance necessary for homeostasis ◦ Volume ◦ Concentration of solutes  Terrestrial animals have. Osmoregulation and Excretion. Osmosis Over time the rates of water uptake and loss must balance. Osmosis- movement of water across a selectively permeable. Freshwater animals show adaptations that reduce water uptake and conserve solutes Desert and marine animals face desiccating environments that can quickly. Osmoregulation and Disposal of Metabolic Wastes Chapter 47. 1 Maintaining the Internal Environment Chapter 49. Osmoregulation and Excretion Chapter 44. Osmoregulation A balancing act The physiological systems of animals  Operate in a fluid environment The relative.